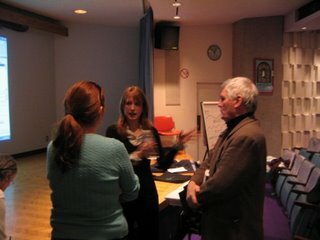 Melanie Sellar has a story to tell and CASLIS Ottawa wanted to hear it. 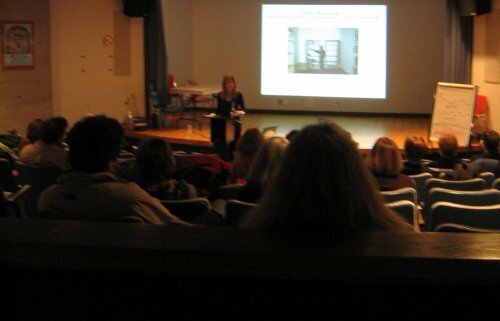 About 30 members made for an enthralled audience on a cold March Thursday for Melanie's tale of the beginnings of Librarians Without Borders. It started in Angola, in early 2004, when the Biblioteca Tutangi opened its doors in Huambo, Angola. Despite the enthusiasm of local university and college students in great need of a Portuguese-language medical library, Biblioteca Tutangi had limitations - for one thing, it had no books! Melanie Sellar, then a new student in the MLIS program at UWO, learned about this institution from an Angolan student studying Anthropology at Western. His enthusiasm and dedication to filling the shelves of this library inspired her to begin work on what she saw as a small project. After all, the sojourn as a graduate student in library and information science is relatively short and very busy; however, these "small", worthy projects have a way of sidetracking lives and Melanie found herself launched into the creation of Librarians Without Borders and her stay at Western became a little longer, and even more rewarding, than anticipated. The first year, 2005, saw the "small project" turn into a federally incorporated, non-profit organization with ever-growing support from the Canadian library community. If the audience's reaction and questions are any indication, Librarians Without Borders has a promising and secure future. And why wouldn't it? Librarianship is founded on the concept of service to our fellow man. Thank you, Melanie and your fellow founders, for reminding us of that with your story of an auspicious start to a worthy cause. For more about LWB, its history and its future as well as your role in its success, visit www.lwb-online.org. Watch for details about the LWB's "Sponsor a Book" campaign later this spring.